Exoskeletons look to redefine the limits of manufacturing workers by providing extra strength and stability to help eliminate fatigue and injuries. Exoskeleton research for industrial applications is a one of the fastest growing fields when it comes to wearable technologies. Exoskeletons can be used on construction sites, for factory labor, in warehouses, and even for medical applications. According to Dr. Joseph Hitt from the Wearable Robotics Association, exoskeletons for manufacturing are the most accessible and “low-hanging fruit” of the exoskeleton market. For the manufacturing industry, they offer three main advantages: a reduction in work related injuries, saving money in medical expenses and sick leave; lower work fatigue, resulting in increased alertness, productivity, and work quality; and the ability to retain experienced personnel past their physical prime in the workforce. Tool-holding exoskeletons. Exoskeletons consist of a spring-loaded arm, such as the zeroG mechanical arm that supports a heavy tool on one end and is connected to a lower body exoskeleton and a counterweight. The heavy tool weight is transmitted to the ground. These exoskeletons are typically passive, but some prototypes have motors in the lower half of the exoskeleton. Chairless chairs. These are lightweight exoskeletons worn on top of work clothes, which can stiffen and lock in place. They help to decrease fatigue while crouching or standing in the same position for extended periods. Back support. Exoskeletons can maintain the correct posture of the back while bending down to perform a lift. They reduce the load on the back muscles while bending down. Powered gloves. These are mechanized gloves that can help workers gain a stronger grasp on tools, or else operate in reverse to help workers who have trouble opening some fingers on their hands to grasp tools. Full-body powered suits. These provide both body support and extra strength. In recent years, developers have focused on smaller, more specialized exoskeleton projects that target a particular body part. However, there are still special projects that use a full body suit, like the new humanoid robot controller from Toyota. Additional/supernumerary robotics. These exoskeletons provide a second pair of hands. They have two or more additional powered arms controlled by the wearer that are used to hold tools or materials in place. These exoskeletons differ from tool-holding exoskeletons in that they are powered, whereas tool-holding exoskeletons are passive. Regardless of their category, exoskeletons can offer several add benefits to the industrial space. Let us explore two case studies that illustrate how they’re being used today. The EksoVest is an upper body exoskeleton that elevates and supports a worker’s arms to assist them with tasks ranging from chest height to overhead. The EksoVest is currently being used on the Ford assembly line. The upper-body exoskeletal tool is designed by a partnership between Ford and California-based Ekso Bionics. The wearable technology is an example of a tool-handling exoskeleton. 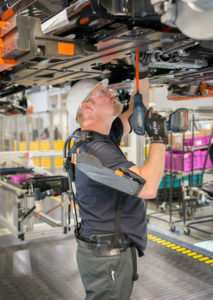 The EksoVest is an upper body exoskeleton that elevates and supports a worker’s arms to assist them with tasks ranging from chest height to overhead. It is lightweight and low profile, making it comfortable to wear in all conditions while enabling freedom of motion. Each arm can provide between 5 to 15 lb. of support per arm. The Levitate Airframe exoskeleton works by transferring weight of the arms from the shoulders, neck, and upper back to the core through pads that rest on the outside of the hips. The Airframe exoskeleton was created by Levitate Technologies, Inc. Like the EksoVest, the Airframe supports the arms of professionals and skilled trade workers who are required to perform repetitive arm motions and/or stationary arm elevation. Engineer Mark Doyle, who also founded Levitate Technologies in 2013, developed the product. Pathway, a design company, works with Levitate to enhance the Airframe’s optimization. The exoskeleton works by transferring the weight of the arms from the shoulders, neck, and upper back to the core musculature through pads that rest on the outside of the hips. This helps by relieving muscle and joint strain. Since it is transferring body weight, the device helps sustain high-quality performance, protects the user, and improves work conditions. The Airframe has a backpack-like design so it can be adjusted to almost any body size with the adjustable straps. The Airframe’s design is light so as not add any extra weight for the user. It is designed to achieve about one million movement cycles in its working mode. It uses igus cylindrical plain bearings with and without flange and thrust washers. In order to adapt to different movements of the wearer and not impede the workflow, Levitate needed the exoskeleton to be not just light and durable, but also compact and able to handle high axial loads of up to 220 lb. The use of plastic bearings such as the iglide G300 and T500 M250, along with special polymer Z materials from igus, helped to achieve all the requirements. Large companies in industries ranging from automotive to agricultural are already testing and using the Airframe. BMW was an early adopter of the Airframe. 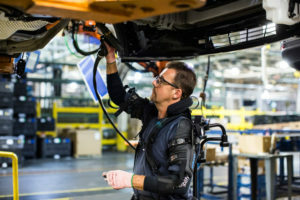 In their factory in Spartanburg, where their SUV X-series vehicles are produced, BMW used 66 Airframe exoskeletons. “During the initial testing and review period at BMW, I observed very positive feedback from the users,” said Joseph Zawaideh, vice president of marketing and business development at Levitate Technologies. “They embraced the Airframe quickly and [the workers] even mentioned that they do not want to go back to not using it…they appreciated that the Airframe was very low profile, lightweight, and did not restrict motion.” BMW announced that the Airframe has outperformed other systems, providing workers a great deal of relief in their U.S.-based factories. Other adopters of Airframe are companies in the agricultural industry. Tests were carried out at an international agricultural manufacturer to study the efficiency of painters and welders using the Airframe. The results showed that Airframe counteracted muscle fatigue, and by using the exoskeleton, the number of painted parts increased by more than 50% and the number of welded joints increased by 86%. In addition to the amount of work, the quality of the work was also significantly better. Both painters and welders were able to carry out their work thoroughly and precisely over longer periods of time.